Vietnam Investment Opportunities | Corr Analytics Inc.
New York, NY. 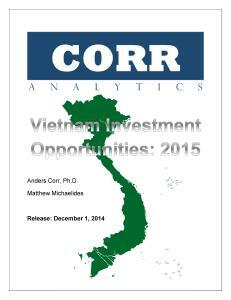 On 12/1/2014, Corr Analytics released the White Paper “Vietnam Investment Opportunities: 2015”, commissioned by Vietnam Report, a Vietnam-based company in the fields of corporate evaluation and rankings. The report includes summary data on the top 31 deals from $7M USD to $4.3B in Vietnam, totaling $21.4B. The deals include both debt and equity, and cover entities with values of $14 million to $9.4 billion that are offering stakes from 20% to 75% in the infrastructure, petroleum, manufacturin g, and finance sectors. In the report, Corr Analytics predicts inflation in Vietnam in 2015 to hold steady at 4.5%, and exports to reach an unprecedented high — $150B. Corr Analytics predicts government debt to decrease due to equitizations, and that non-performing loans will decrease to 3% by 2015. Finally, Corr Analytics predicts in the report that the government will take additional steps to improve investor confidence in Vietnam, including through a measured approach to highly selective privatization that unlocks sector potential but protects local communities, the environment, and government value. Corr Analytics predicts that the government will pay increasing attention to price stability, decreasing corruption, arbitration enforcement, and improved transparency at local levels, thereby unlocking major gains in foreign direct investment and GDP growth over the next five to ten years.